Being that the best experienced Colonial Pilots are spread thin these days, Captain Apollo rarely gets to share the skies with his best friend… Lt. Starbuck. Such was one of these days. A colony-type planet had been detected a few light years in front of the fleet and needed to have some recon done…. their names were first on the flight roster. Detecting no hostile presence, the two friends shoot for the deck of the planet to discover most of it covered with water. Alone, with beautiful skies above, deep blue oceans below…. and a whole world of freedom waiting to hear the screaming of Viper engines for the first time….. Apollo looks over at Starbuck… who just nods, and waves his hand as if to say “after you” while placing his cigar back in his mouth…. 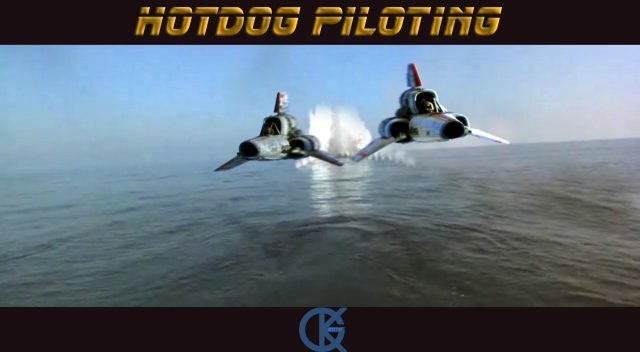 their hot dog piloting was about to begin. Continuing as the second “atmospheric flight” composite collection piece suggested for me to do by master artist Ben Lim, while using my Blue Screen photos of the fantastic studio Viper builds done by R.L. Bleecker from the hyper accurate MSLZ22 Model kits, and using a few elements from various sources… I was able to create this scene as I viewed it in my head. What I found especially challenging was getting the reflections correct both on the Vipers themselves… as with the water beneath them. The angle of the sun made it very difficult to determine what was to be seen.